In one of the funnier spoofs of Game of Thrones, Snow Knows goes into 34 seconds of detail per episode about what Jon Snow really knows. Ranging from his knowledge of romance, to wargs, to giants, to the wall, every single thing Snow thinks he knows is actually thrown out the window. The animation is very crisp, and the episodes move along even without the aid of voiceovers. 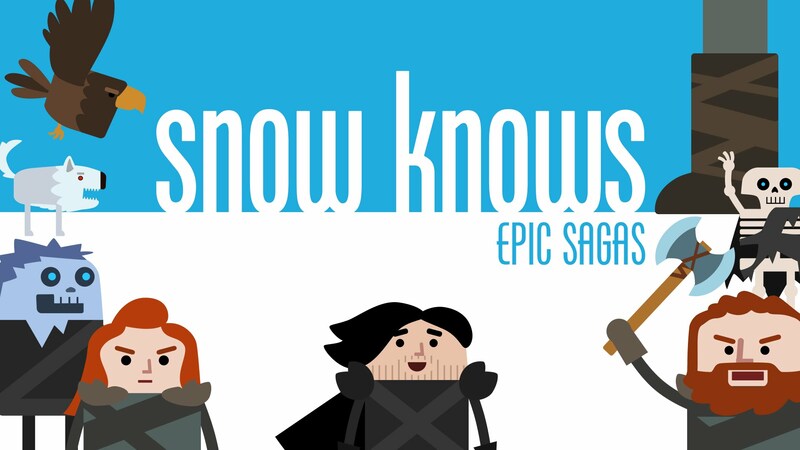 With that said, check out Snow Knows “Epic Sagas,” which is a compilation of all of the episodes in one neat video. It makes for a great intro to your Game of Thrones party this weekend. ← Previous [Video] Joe Lo Truglio shows up to No, You Shut Up! Anime, gaming, action, I do it all. Most of it shows up on the Broadcast Bubble show, Gaming on Cybertron. Tuesdays at 9 pm, right here on BubbleBlabber!